That's right - it's 12-12-12! 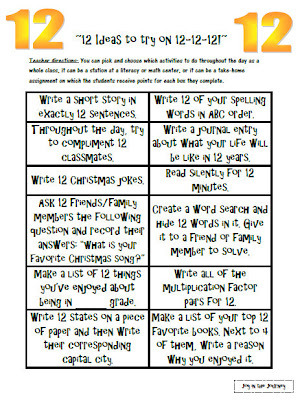 To celebrate, I've come up from a FREE list of 12 activities to try on 12-12-12. Teachers, you can pick and choose which activities to do throughout the day as a whole class, it can be a station at a literacy or math center, or it can be a take-home assignment on which the students receive points for each box they complete. Also, I wanted to share some exciting news: I have become a contributor for a great new collaborate blog called Fifth Grade Freebies. It's a blog with posts written by a myriad of 5th grade teachers - and the best part is, all of the activities and worksheets on there are FREE! Many of them could be used in various classrooms across several grades. Check it out!